I really like Leedy drums. I know some of you share my passion for these fine American made drums. 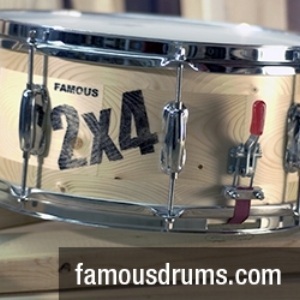 I just love the history of this company, and besides, the drums are high quality and beautiful. When I was a young boy there was a sign artist that lived next door to us. He painted signs for businesses and such, and he was a very good painter. On day I went over to his shop and there was a drum head he was painting for a local band. They were called The Wild Cherries. I remember the look of the letters on the head and what stuck out the most was the Leedy logo on the head. I had seen the Ludwig logo on Ringo's drum head and I was not as dumb as some people to think it was part of the band's name. I had never heard of Leedy drums and so I guess I was dumb at first to think the band's name was Leedy the Wild Cherries. 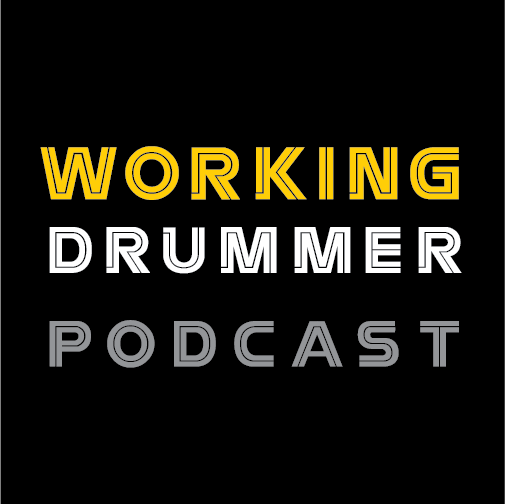 I soon started learning information about Leedy drums from another drummer who told me they were the same as Ludwigs. That information wasn't exactly right even though Ludwig and Leedy were owned by the same company for many years, and Leedy and Ludwig were even combined for a few years in the early 1950s. Then I had a friend who had a set similar to the set I'm featuring from my collection this month. He told me Leedy was not just like Ludwigs they were just like Slingerland drums. He was also somewhat right, because Slingerland bought Leedy from Conn in the late 50s and basically made what some people call "Slingerleedys". 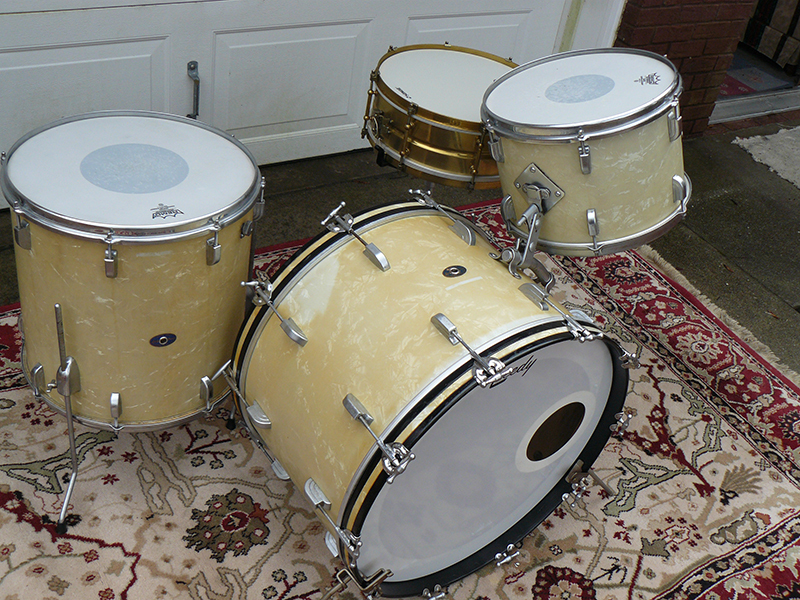 This drum set from my collection is a Slingerland built Leedy set from the early 1960s. Leedy drums from this era (1956-1965) are very similar in every way to Slingerland drums with the exception of the lugs and badges. This set is a 22", 16", 13" set in standard depths. The lugs are Beavertail Leedy Lugs. 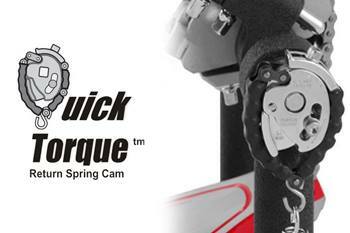 You will hear the expression "Art Decco Design" when referring to these sleek modern looking lugs. The blue oval Leedy badges have Chicago 48, ILL. USA on them. This will date them 1960's. 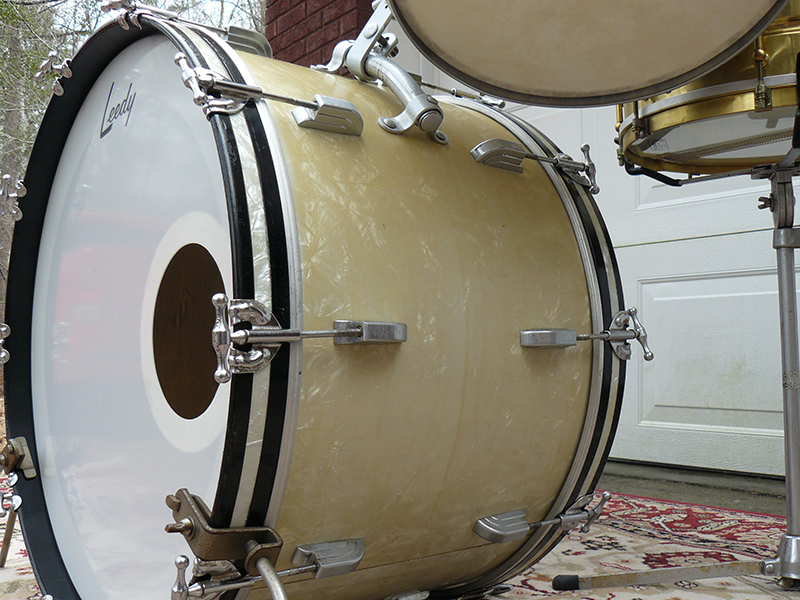 The first Leedy badge Slingerland made was a brass oval that dates drums mid 50s. The first blue oval badge '57-'58 didn't have the 48 after Chicago. The rims are "Stick Savers just like Slingerland drums. The Finish is yellowed white marine pearl. The set looks almost butterscotch. The yellowing is not consistent over the whole set. Something interesting to notice in the photos are the unfaded areas on the kick drum. The set had a cloth muffler across the batter head with excess cloth covering an area on the shell. Where the cloth shaded the shell the finish is still white. There is another white area where the front calf head was not tensioned equally. The place where the head covered the shell is still gleaming white. There was also a small sticker on the bass drum shell by the badge, and on the floor tom shell that covered a small spot. If the drums had been kept covered by a sheet when not in use they would probably be a lot whiter than they are now after 55 years. Any way, I still love that vintage "vibe" these drums have. They are beautiful to me. I always share my adventures in collecting, because it is a lot of fun and exciting to score a great drum set. I buy some drums on E-Bay and I am not at all knocking that method of acquiring vintage drums, although It is like fishing in a barrel. It's more fun, and you really feel like you have scored when you find drums at good prices from owners or unlikely places. I realize that's more difficult now and it's becoming more difficult all the time. These drums were owned by my great friend Butch Braddy. I've told you before that he has helped me get a lot of drums over the years. He is the sales manager of the drum department at a large music store in a local city. He gets the opportunity to pass on or buy a lot of great vintage drums. I am so glad he's my friend. If he is letting something go or thinning his collection, I get a call. I try to keep some cash ready for just such an emergency. He called me recently to tell me about this Leedy set that he was parting with. I was there to lift his burden as soon as I could get to him. Thanks, Butch for this great set. Until next time, always peek into those dumpsters. You never know when someone has tossed out a Leedy Black Elite snare drum.